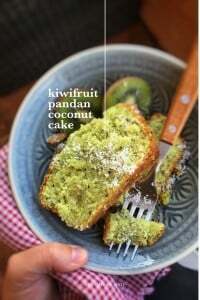 Kiwifruit Cake with Coconut & Pandan | Simple. Tasty. Good. Kiwifruits… can I make anything else with them apart from (cup)cake and pie decorations? Let’s try a kiwifruit cake then as and experiment, just like you would prepare banana bread! This is the very first cake batter I prepared in my KitchenAid Cook Processor because it’s great to mix flours, batter and doughs with! But a classic mixing bowl will also work just fine of course! You can also use your stand mixer to make this cake batter of course! 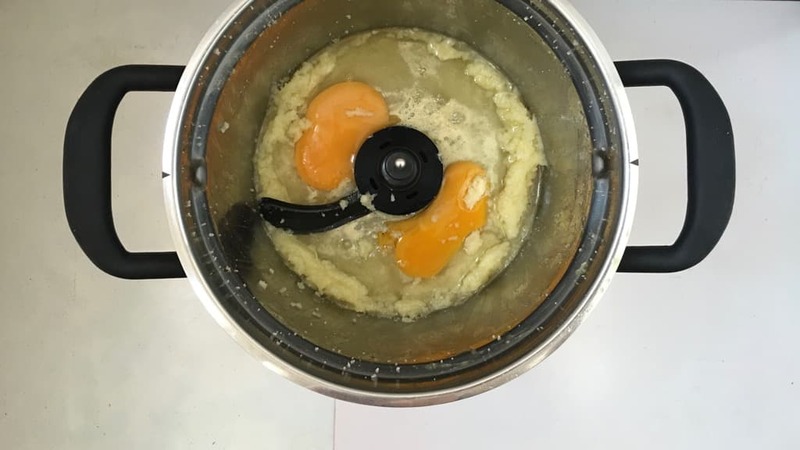 Back then I didn’t have one (now I do) so I used my Cook Processor to combine the batter. First off: the manual recipe. After that you can find the stand mixer and Cook Processor recipes. 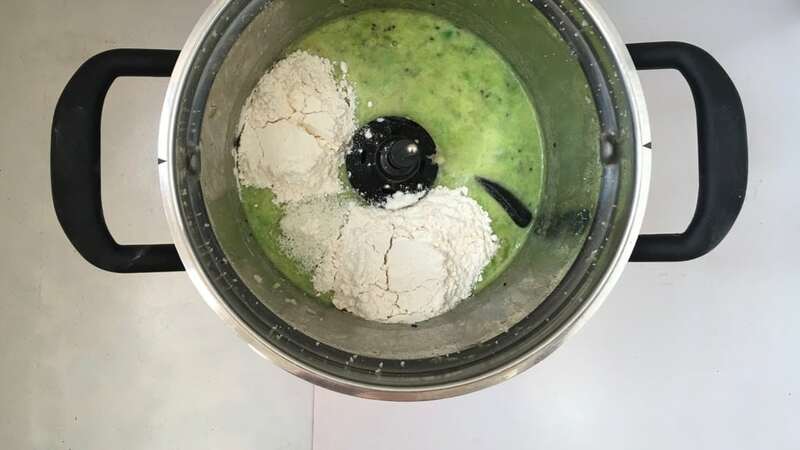 I used pandan extract which is an Asian flavoring extracted from pandan leaves. If you’re not familiar with the pandan aroma, then you would think it is vanilla: and there’s your substitute right there. The advantage of pandan is the light green color it adds to food. Add the soft butter and sugar to a large mixing bowl. Whisk the sugar and butter for 3 minutes until soft and creamy. Then add the eggs. Whisk the butter, sugar and eggs well until very creamy and pale. Peel the ripe kiwifruits and chop them up finely. 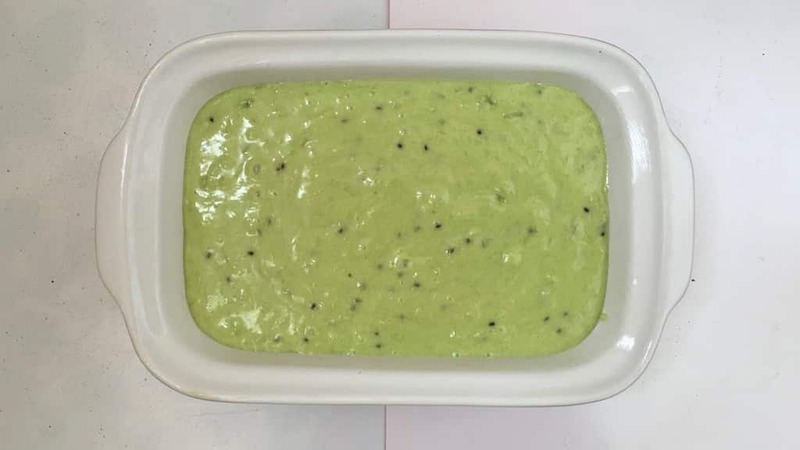 Mash the kiwifruit into a pulp. Then add it to the egg mixture. Season with a pinch of salt and add the drops of pandan extract (or vanilla extract) and lemon juice. Stir the fruit mixture well. Then add the flour and grated coconut. Stir into a thick batter. Once well combined, let the batter rest for 10 minutes. Then butter or oil a cake tin and spoon the cake batter into it. Bake the cake in a preheated oven at 350°F (180°C) for 35 to 40 minutes or until set in the center. Then remove the cake from the hot oven and let it cool in its tin. Slice the cake up and serve lukewarm. What a soft tea cake then: this kiwifruit cake is delicious! 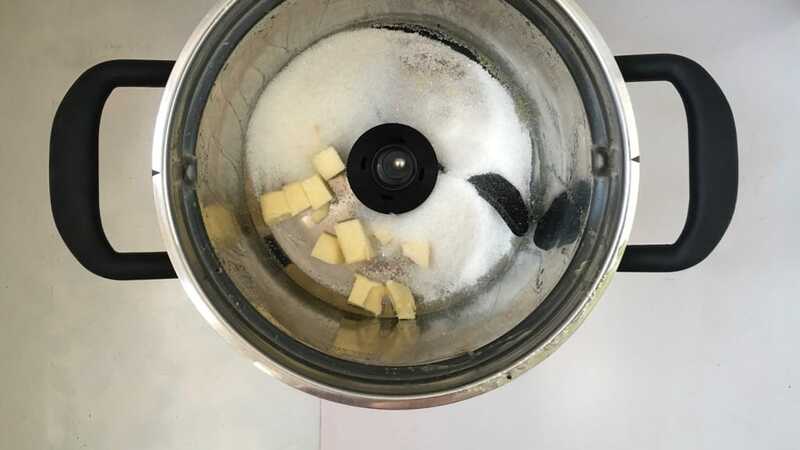 Add the soft butter and sugar to the mixing bowl of your stand mixer. Lower the mixer head and set speed 4 for for minutes until soft and creamy. Then add the eggs. At the same speed whisk the butter, sugar and eggs well for 2 minutes until very creamy and pale. 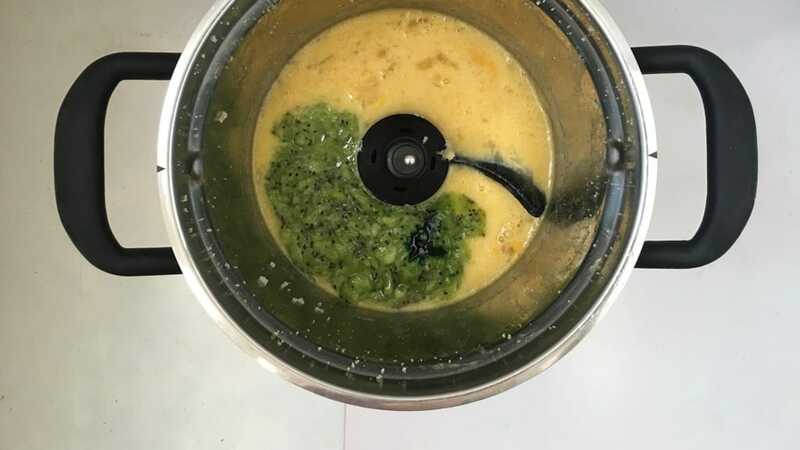 Then add the mashed kiwifruits to the egg mixture. Season with a pinch of salt and add the drops of pandan extract (or vanilla extract) and the lemon juice. 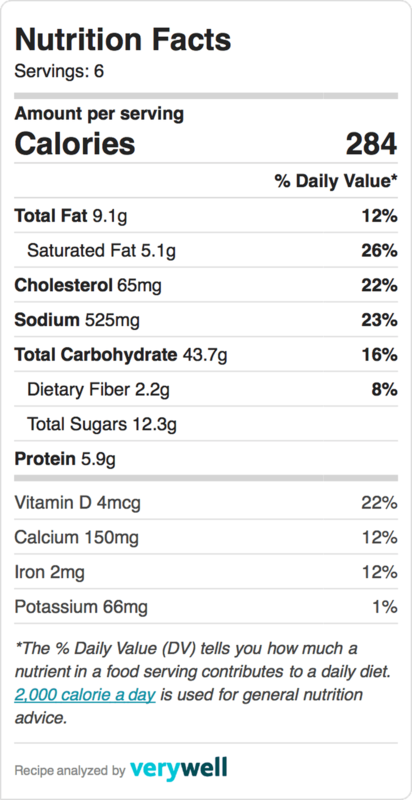 At the same speed whisk the ingredients for a minute. Then add the flour and grated coconut. Whisk for another 3 minutes until you end up with a thick batter. Once well combined, let the batter rest for 10 minutes. Then butter or oil a cake tin and spoon the cake batter into it. Bake the cake in a preheated oven at 350°F (180°C) for 35 to 40 minutes. The cake should have set in the center. Then remove the cake from the hot oven and let it cool in its tin. Slice the cake up and serve lukewarm. 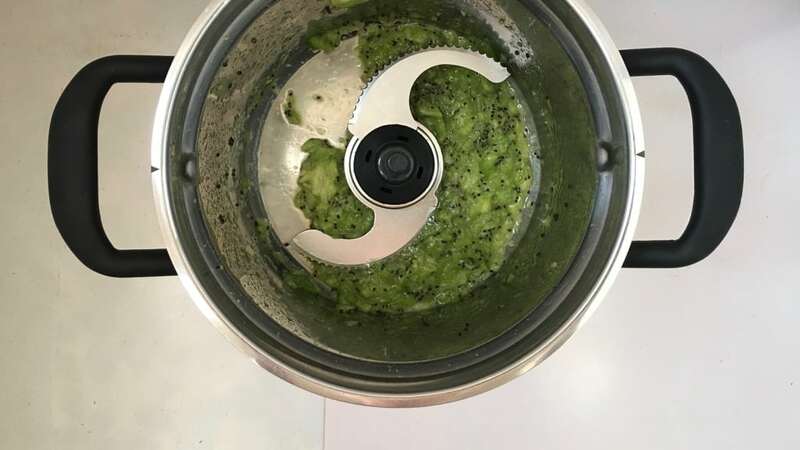 Add the kiwifruit to the bowl of the Cook Processor fitted with the MultiBlade. Press PULSE for 10 seconds. Transfer the fruit pulp to a cup. Remove the MultiBlade and clean the bowl. Place the StirAssist in the bowl. Then add the soft butter and sugar. Manually set the timer to 3 minutes, press Start and increase the SPEED to 3. Whisk the sugar and butter until creamy. Then add the eggs. Manually set the timer to 2 minutes, press Start and increase the SPEED to 3. Whisk the butter until very creamy. Then add the kiwifruit puree, a pinch of salt, the pandan extract (or vanilla extract) and lemon juice. Manually set the timer to 2 minutes, press Start and increase the SPEED to 3. Stir the fruit mixture well. Then add the flour and grated coconut. Manually set the timer to 4 minutes, press Start and increase the SPEED to 3. Stir the ingredients until you have a gooey batter. Then let it rest for 10 minutes. Butter or oil a cake tin and fill with the cake batter.